Russian experts ask how U.S.-Russia relations will be affected by the Snowden case. While the U.S. demands that Russia detain former C.I.A. agent Edward Snowden, Russian experts ask how U.S.-Russia relations will be affected by the case. Russian human rights ombudsman Vladimir Lukin argues that the United States has no right to demand Snowden's arrest from Russia. "The Americans can't demand anything. We can extradite him, or we can refuse to extradite him," Lukin said. "It's a good detective story. I would like it to develop without me. I don't work with detective stories. Detective stories are good bedtime reading." Political analyst Alexei Makarkin, the first vice president of the Center for Political Technologies, belives that the Snowden case won't worsen the already complicated relations between Moscow and Washington. Yet, he added, it clearly indicates the possibility of the termination of the U.S. reset policy. "The Snowden case is a piece of the general context of Russia-U.S. relations. A harsh and emotional reaction from Washington would have occurred if the situation had been at contrast with the generally good and remarkable relations and the sides had had a high level of mutual trust. I do not think the situation may worsen the relationship, which is already complicated," Makarkin told Interfax. The U.S. reaction, and Russia's behavior are a natural given the current relationship, said the expert. "What was happening in major spheres of [interaction between] Russia and the U.S.? There was an ambitious nuclear disarmament proposal from Obama, which bumped into missile defense and some other complex problems of the bilateral relationship. Russia took the proposals rather calmly. True, there was a certain surge of optimism about the possibility to agree on Syria, but the latest events displayed the opposite trend," Makarkin said. Makarkin thinks that Obama will not push Russia too hard to Snowden because he wants to preserve the reset. "The United States is already eyeing presidential candidates for 2016. If the vector of the relations does not change, three years from now the Americans are likely to have a president who will close the reset question. The issue is important for Obama and he does not want to abandon it publicly. Otherwise, he will seriously damage his image and hear criticism not only from the Republicans, but also from many Democrats for his inefficient policy on Russia," Makarkin said. "The U.S. political class is viewing relations with Russia in the context of the official end of the reset policy and the possibility of further deterioration in relations." 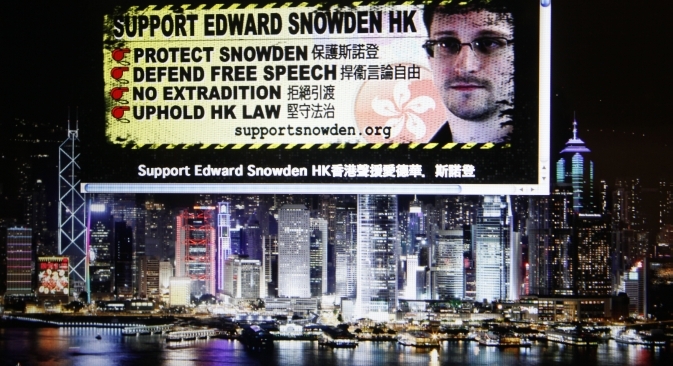 How can the U.S. catch Snowden? According to a source in the air traffic control services of Moscow's Sheremetyevo airport, U.S. air traffic controllers can forcibly land the plane carrying Snowden from Moscow to Cuba when it flies over U.S. waters if they have good grounds for this. "No doubt, our U.S. colleagues have the formal right to land the plane when it enters U.S. airspace, which is their responsibility zone. However, they will have to provide good reasons for that," the source said. The plane's captain, in turn, may change the route in such a way as to avoid entering the U.S. airspace. "There should be enough fuel for that. As a rule, there is always some fuel reserve in planes. The courses are made initially using the shortest route, but planes get reserve fuel for unforeseen situations," the source addded. Meawhile, a source in the U.S. told Interfax that U.S. authorities may demand that the plane expected to carry Snowden to Cuba land in U.S. territory. The source said every country can demand that any aircraft entering its zone of responsibility land for public safety or military reasons based on the current international regulations. Aeroflot's routes to Havana take planes along the eastern coast of the U.S. A large part of the route located along the is in the area of responsibility of New York air traffic controllers. Snowden was expected to leave Moscow for Havana at 2:05 p.m. on Monday. He has most likely left Russia, according to a source familiar. "Edward Snowden is most likely already outside the Russian Federation. He could have taken a different plane. It is unlikely that journalists could have witnessed his departure," the source said. According to earlier reports, Snowden could have left for Cuba on Monday afternoon. However, he did not take the plane en rote from Moscow to Havana.